The Glenbrook Countryside Property Owners’ Association (“GCPOA”) has a Covenants, Building & Zoning Compliance Committee (“CBZCC”), which oversees the safety of new construction and remodeling, adherence to neighborhood covenants and provides information to assist in expediting the building process. The Glenbrook Countryside Property Owners’ Association works closely with the Cook County Building and Zoning Departments through the Compliance Committee. The first step toward building in Glenbrook Countryside, is to show that your plans are in compliance with Glenbrook Countryside covenants. Once compliance is determined, you will be issued a Compliance Notification Letter, which will allow you to obtain your building permit from Cook County. This category of work includes new construction, demolition, building additions, major renovations, and attached garages, that may impact FAR limits, covenanted yard setbacks and height restrictions, requiring a permit through Cook County and Northfield Township. Download and fill out the Construction Review Application Form, and e-mail, with your intent to build, to the CBZCC at: Construction@gbcountryside.org To ensure your email is received and not deleted as ‘spam’ you must put your Glenbrook Countryside property address in the ‘Subject Line’. Please submit only Full and Complete Permit Ready Sets. The Application fee is one hundred dollars ($100) for the first one thousand square feet (or less) of construction. For each additional one hundred square feet of construction exceeding one thousand square feet, the cost is ten dollars ($10) per one hundred square feet of construction. The Committee meets on the last Monday of every month. If all items in numbers 1, 2, and 3 are received on or prior to the fifteenth (15th) of the month, your proposed construction will be reviewed at the next meeting of the Covenants, Building and Zoning Compliance Committee. If you are in compliance with Glenbrook Countryside covenants and restrictions, after review by the Compliance Committee, Glenbrook Countryside Property Owners’ Association (GCPOA) will provide you with a Compliance Notification Letter and your plans will be signed and sealed by GCPOA. GCPOA will retain one complete set of plans for their files. Submit the Compliance Notification Letter along with your application to the Cook County Building & Zoning Departments and Northfield Township. Note: Cook County will not issue a building permit without this letter. This category of work includes porches, sheds, detached garages, greenhouses, gazebos, and any other accessory buildings or structures that require a permit through Cook County and Northfield Township. The Application fee is Ten dollars ($10) for the first one hundred square feet or less, or Twenty Five dollars ($25) for construction projects greater than on hundred square feet. This category includes permitted construction projects such as interior remodeling, roof replacement, driveway paving, fence construction, and the installation of a swimming pools. These projects do not alter the existing FAR, yard setbacks or garage size, thus outside our scope of review. Upon receiving the completed Construction Review Application Form the CBZCC will issue a letter of compliance, without the necessity of a Committee Board review or a fee. Receiving a permit without the Compliance Notification Letter will result in legal action to cease construction, and covenant or building violations will need to be corrected, and may result in fines. Indicate and label all setbacks (front, sides and rear). Dimension actual setbacks of proposed structure(s) to the nearest point on lot line. Provide the square footage of the Garage. (See Garage size limits below). Indicate ceiling height on all attic or other open areas. (Anything over 7′ 6″ must be included in the FAR). 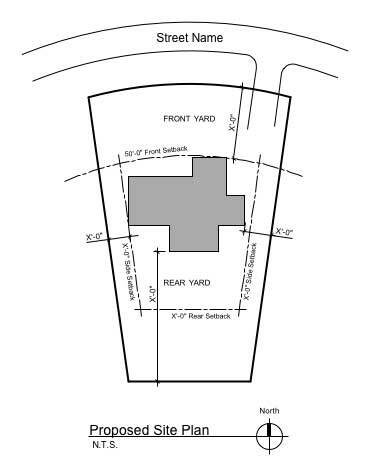 In obtaining a Cook County Building Permit, the applicable R-4 (single-family residential) zoning regulations require a 40 foot front setback (distance from the front of the structure to the property line). However, the Glenbrook Countryside Plat of Subdivision (Document 13802722) typically requires a more restrictive front setback of up to 50 feet. Exceptions include corner lots and lots of unusual shape. The general rule is that more restrictive private subdivision regulations will prevail over less restrictive zoning regulations. Additional restrictions are contained in Document 13811188. Being in compliance with Cook County Building Regulations for a permit may not be a homeowner’s only restriction. Check your title. Attempting to ignore the Plat of Subdivision setback restrictions may render your title insurance invalid, and can affect the future sale of your home. We strongly recommend that you consult with an attorney familiar with zoning matters before proceeding with your expansion plans. For your convenience, here is list of the setbacks. Do not rely on this sheet, it is only for general reference. Contact the GCPOA Building Committee to confirm your setback. All Villages have a FAR restriction. The FAR for Glenbrook Countryside is .25 or 25%. This is calculated by taking your lot size and multiplying it by .25. With most homes having 1/2 an acre, this provides for a fairly large home, which should not be an issue for the majority of homes constructed. The floor area of a building is the sum of the gross horizontal areas of the several floors of the building measured from the exterior faces of the exterior walls or from the center line of walls separating two (2) buildings. The floor area of a building shall include basement floor area when more than one-half (1/) of the basement height is above the established curb level or above the finished lot grade level where curb level has not been established, elevator shafts and stairwells at each floor, floor space used for mechanical equipment – (except equipment, open or enclosed, located on the roof), penthouses, attic space having headroom of seven feet, six inches (7’6″) or more, interior balconies and mezzanines, enclosed porches, and floor area devoted to accessory uses. However, any space devoted to off street parking or loading shall not be included in “floor area”. The “floor area” of structures devoted to bulk storage of materials – including but not limited to, grain elevators and petroleum storage tanks shall be determined on the basis of height in feet; i.e., ten (10) feet in height shall equal one floor. The maximum building height for Glenbrook Countryside is 30 feet as measured per the Cook County Zoning Ordinance. C. Mean level of the underside of the rafters between the eaves and the ridge of a gable, hip, shed, gambrel, or any other pitched roof. Note: Any building with one or more four-sided roofs with a pitch equal to or in excess of 21/12 will be considered to have a mansard roof. Private Garage(s), attached and/or detached, are permitted and shall not exceed a total of nine hundred twenty (920) square feet of construction, with a maximum of 4 cars. However, a Property Owner may construct a Private Garage up to one thousand (1000) square feet, if the Property Owner subtracts eighty (80) square feet of floor area from the permitted Floor Area Ratio for the primary residence. Any Private Garage construction above one thousand (1000) square feet is prohibited. Commercial Garages are prohibited. Additional Accessory Buildings may be placed or constructed on a Lot as long as the addition of such Accessory Buildings would not exceed the permitted Floor Area Ratio for the Lot. Additionally, the total square footage of all and/or a single Accessory Building on any one Lot cannot exceed a total of four hundred (400) square feet. Construction Fences: For the safety of our children, a secure construction fence is required. Porta-Pottys: Locate within the construction fencing and per the Cook County Building requirements. Hours: Please work within the allowable work hours prescribed by Cook County Ordinance. 920 W. North Shore Dr.
Civil Engineering Review: New Construction involving; alterations, revisions or changes to lot grading, effecting surface water drainage, will require a review by the local Township authority. Please contact Construction@gbcountryside.org if you plan on building.